In the Book of Jubilees. The haggadic assumption that there are seventy nations and languages in the world is based upon the ethnological table given in Gen. x., where seventy grandsons of Noah are enumerated, each of whom became the ancestor of a nation. 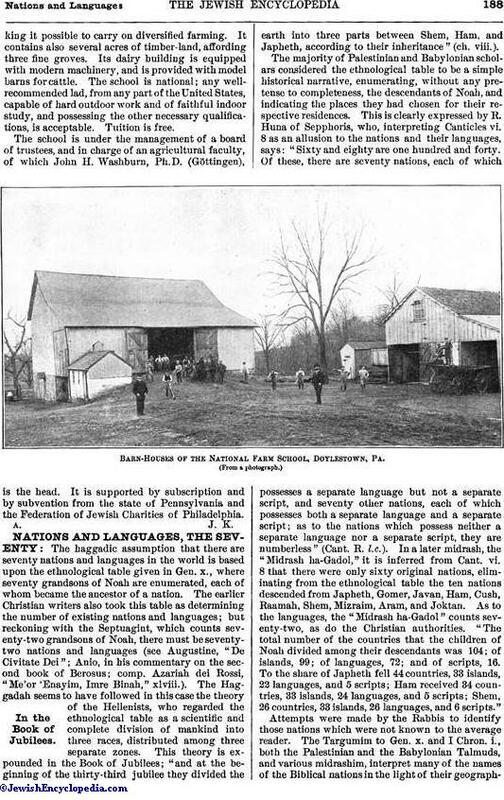 The earlier Christian writers also took this table as determining the number of existing nations and languages; but reckoning with the Septuagint, which counts seventy-two grandsons of Noah, there must be seventy-two nations and languages (see Augustine, "De Civitate Dei"; Anio, in his commentary on the second book of Berosus; comp. Azariah dei Rossi, "Me'or 'Enayim, Imre Binah," xlviii.). The Haggadah seems to have followed in this case the theory of the Hellenists, who regarded the ethnological table as a scientific and complete division of mankind into three races, distributed among three separate zones. This theory is expounded in the Book of Jubilees; "and at the beginning of the thirty-third jubilee they divided the earth into three parts between Shem, Ham, and Japheth, according to their inheritance" (ch. viii.). The majority of Palestinian and Babylonian scholars considered the ethnological table to be a simple historical narrative, enumerating, without any pretense to completeness, the descendants of Noah, and indicating the places they had chosen for their respective residences. This is clearly expressed by R. Huna of Sepphoris, who, interpreting Canticles vi. 8 as an allusion to the nations and their languages, says: "Sixty and eighty are one hundred and forty. Of these, there are seventy nations, each of which possesses a separate language but not a separate script, and seventy other nations, each of which possesses both a separate language and a separate script; as to the nations which possess neither a separate language nor a separate script, they are numberless" (Cant. R. l.c.). In a later midrash, the "Midrash ha-Gadol," it is inferred from Cant. vi. 8 that there were only sixty original nations, eliminating from the ethnological table the ten nations descended from Japheth, Gomer, Javan, Ham, Cush, Raamah, Shem, Mizraim, Aram, and Joktan. As to the languages, the "Midrash ha-Gadol" counts seventy-two, as do the Christian authorities. "The total number of the countries that the children of Noah divided among their descendants was 104; of islands, 99; of languages, 72; and of scripts, 16. To the share of Japheth fell 44 countries, 33 islands, 22 languages, and 5 scripts; Ham received 34 countries, 33 islands, 24 languages, and 5 scripts; Shem, 26 countries, 33 islands, 26 languages, and 6 scripts." 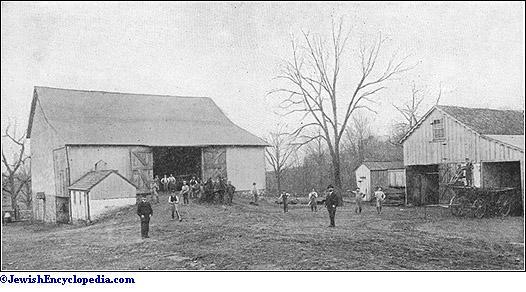 Barn-Houses of the National Farm School, Doylestown, Pa.
Gomer. Carthagena ( ; according to some sources, Gothia). Javan. Macedonia (according to some sources, Ephesus). Togarmah. Germanicia (city in the province of Commagene). Elishah. Æolis (in Asia Minor). Tarshish. Tarsus (city in Asia Minor). Kittim. Italy (southern; according to some sources, Hellas). Dodanim. Dardania (a district in the southwestern part of Mœsia). Phut. Marmarica (between Egypt and Cyrenaica). The Sons of Cush and Raamah. Seba. Syene (the frontier town of Egypt to the south). Havilah. India (in Africa, south of Egypt). Sabtah. Lembritæ (to the south of Meroë). Raamah. Libya (between Egypt and Ethiopia). Sabtecah. Region on the eastern coast of Africa. Sheba. Mons Samaragdus (along the Red Sea). Nimrod's Kingdom and His Foundations. Frech. Warka (on the left bank of the Euphrates; according to some sources, Charon in Media). Accad. Cascara (on the Tigris; according to some sources, Nisibin). Caineh. Nippur (unidentified by the Midrash; according to some sources, Ctesiphon). Rehobot. Probably a suburb of Nineveh. Lohabim. Nomos in North Egypt. According to the Rabbis, each of the seventy nations is placed under the protection of a special angel, except Israel, whose protector is God Himself (Gen. R. xxxvii.). On the Feast of Tabernacles, it is said in a haggadah, seventy sacrifices were offered, one for each nation. "Wo to the nations!" says R. Johanan; "they had suffered a great loss without realizing what they had lost. While the Temple existed the altar [the sacrifices] atoned for them; but now who will atone for them?" (Suk. 55a; Pesiḳ. 193b, 195b). There was a discussion between R. Eleazar and R. Johanan with regard to the languages spoken before the Dispersion. 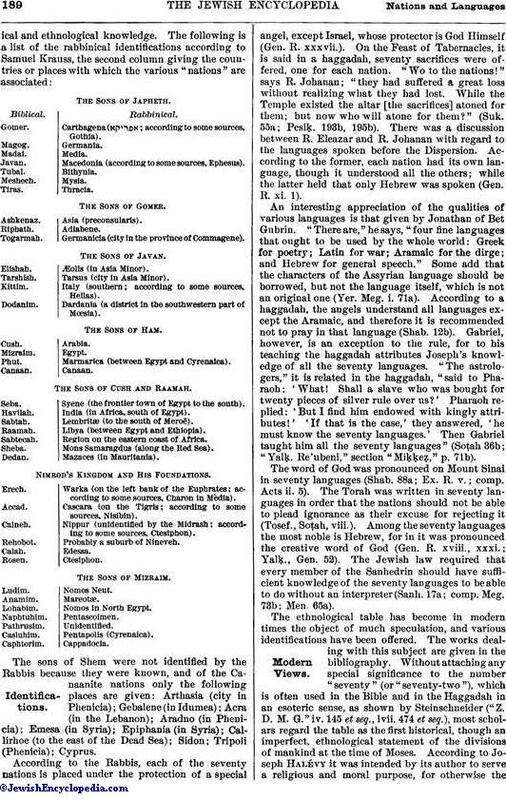 According to the former, each nation had its own language, though it understood all the others; while the latter held that only Hebrew was spoken (Gen. R. xi. 1). An interesting appreciation of the qualities of various languages is that given by Jonathan of Bet Gubrin. "There are," he says, "four fine languages that ought to be used by the whole world: Greek for poetry; Latin for war; Aramaic for the dirge; and Hebrew for general speech." Some add that the characters of the Assyrian language should be borrowed, but not the language itself, which is not an original one (Yer. Meg. i. 71a). According to a haggadah, the angels understand all languages except the Aramaic, and therefore it is recommended not to pray in that language (Shab. 12b). Gabriel, however, is an exception to the rule, for to his teaching the haggadah attributes Joseph's knowledge of all the seventy languages. "The astrologers," it is related in the haggadah, "said to Pharaoh: 'What! Shall a slave who was bought for twenty pieces of silver rule over us?' Pharaoh replied: 'But I find him endowed with kingly attributes!' 'If that is the case,' they answered, 'he must know the seventy languages.' Then Gabriel taught him all the seventy languages" (Soṭah 36b; "Yalḳ. Re'ubeni," section "Miḳḳeẓ," p. 71b). The word of God was pronounced on Mount Sinai in seventy languages (Shab. 88a; Ex. R. v.; comp. Acts ii. 5). The Torah was written in seventy languages in order that the nations should not be able to plead ignorance as their excuse for rejecting it (Tosef., Soṭah, viii.). Among the seventy languages the most noble is Hebrew, for in it was pronounced the creative word of God (Gen. R. xviii., xxxi. ; Yalḳ., Gen. 52). The Jewish law required that every member of the Sanhedrin should have sufficient knowledge of the seventy languages to be able to do without an interpreter (Sanh. 17a; comp. Meg. 73b; Men. 65a). The ethnological table has become in modern times the object of much speculation, and various identifications have been offered. The works dealing with this subject are given in the bibliography. Without attaching any special significance to the number "seventy" (or "seventy-two"), which is often used in the Bible and in the Haggadah in an esoteric sense, as shown by Steinschneider ("Z. D. M. G." iv. 145 et seq., lvii. 474 et seq. ), most scholars regard the table as the first historical, though an imperfect, ethnological statement of the divisions of mankind at the time of Moses. 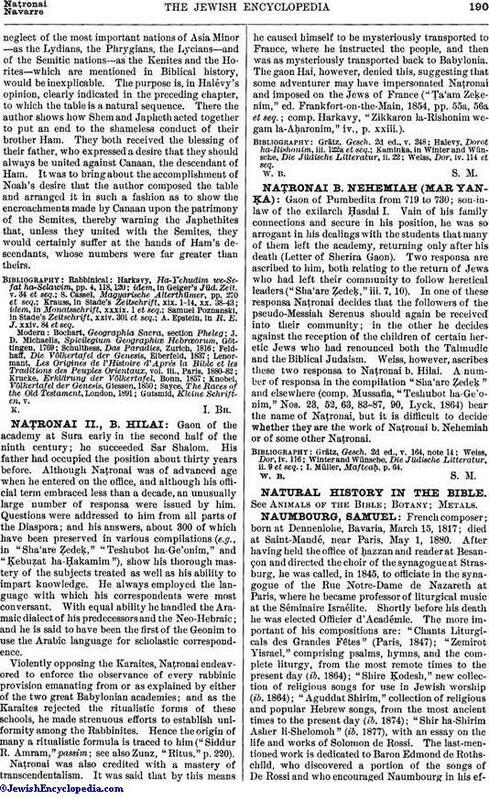 According to Joseph Halévy it was intended by its author to serve a religious and moral purpose, for otherwise theneglect of the most important nations of Asia Minor—as the Lydians, the Phrygians, the Lycians—and of the Semitic nations—as the Kenites and the Horites—which are mentioned in Biblical history, would be inexplicable. The purpose is, in Halévy's opinion, clearly indicated in the preceding chapter, to which the table is a natural sequence. There the author shows how Shem and Japheth acted together to put an end to the shameless conduct of their brother Ham. They both received the blessing of their father, who expressed a desire that they should always be united against Canaan, the descendant of Ham. It was to bring about the accomplishment of Noah's desire that the author composed the table and arranged it in such a fashion as to show the encroachments made by Canaan upon the patrimony of the Semites, thereby warning the Japhethites that, unless they united with the Semites, they would certainly suffer at the hands of Ham's descendants, whose numbers were far greater than theirs. A. Epstein, in R. E. J. xxiv. 84 et seq.